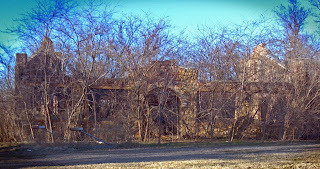 Near the shores of Oologah Lake we found one of Oklahoma's oddest roadside attractions. 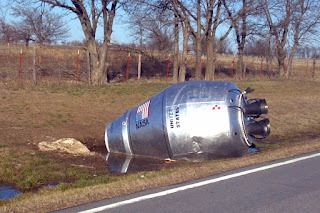 The mysterious space capsule of Winganon, Oklahoma. This startlingly authentic sight is actually the work of local artists Barry and Heather Thomas who decided to freshen up the local landmark last September. 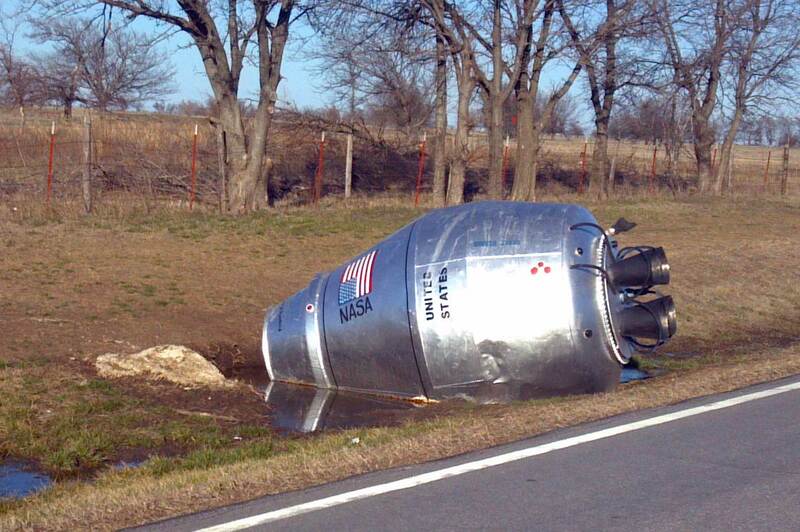 What appears to be an Apollo rocket capsule is actually a cement mixer on the shoulder of Winganon Road. The legend goes that a cement truck crashed on this spot in 1959. By the time a wrecker arrived the truck's load had hardened. Unable to manage so much weight, the wrecker retrieved the truck but left the cement mixer for later. Of course later never came, and the oversize paper weight became an impromptu landmark. Eventually graffiti artists discovered the relic, then locals decided to spruce it up. Before this latest incarnation it was painted in a patriotic stars-and-stripes motif. The truck's ill-fated load of concrete was destined for the Winganon Road bridge. It's a long stretch of asphalt, just a couple of miles east of the mixer's final resting place, that bisects the northern end of Oologah Lake. Without this bridge the town of Winganon, and the route to Chelsea, would have been under water after the lake was filled in 1964. Be sure to check out the ruins of the old schoolhouse in Winganon on the other end of the bridge. Hidden in a tangle of trees, it looks like something straight from a Stephen King novel. Today the Winganon Space Capsule is listed on Roadside America and even has a Facebook page where you can submit your own photo of the space capsule! The "crash site" is located about a mile east of US-169 on Winganon Road, not far from Talala, Oklahoma.